ef37a wrote: The cassette medium was never I would aver designed to archive music for decades? Nope. It was designed and intended to be a mono voice dictaphone format! It was really only the advent of Dolby B and better tape formulations that enabled it to be upgraded into a consumer stereo music format. I really never had problems with cassettes jamming or tangling up myself, although I did have a quite a few machines come in for repair in that state. If you bought decent tapes to start with, kept them wound up in their boxes and use a decent, CLEAN machine you should very rarely have an issue. Yes, keeping the machine clean is paramount, and using decent tape stock (avoiding the ultra-thin extra-long play tapes). You only have to take vinyl out of its sleeve ONCE and it is buggered in some way! That seems a little overly pessimistic! You've worked in BBC Local Radio then? 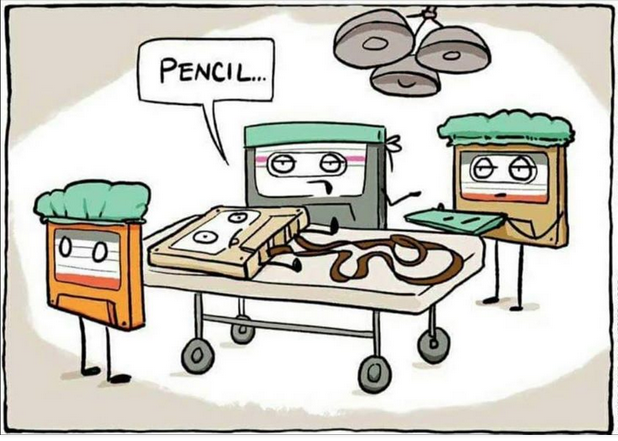 No, but that didn't stop a ton of people from archiving to cassette! I wonder how many here experienced the video equivalent of the Music cassette, the Philips Video 2000 system? The mandate from On High was that it had to be a flipover cassette on 1/2" tape and NO tracking control was allowed to adjust for replay of tapes from other machines. The Philips engineers succeeded famously and despite the half tape width the results were easily as good as VHS or Betamax. Unfortunately the first machines were huge and pretty unreliable. The next generation were far more compact and reliable but The World was not interested in yet another formats war and the system died out. Philips kept the "dynamic track following" technology however and used it in their VHS machines. That, as they say is another story! ef37a wrote: The Philips engineers succeeded famously and despite the half tape width the results were easily as good as VHS or Betamax. Do you mean HiFi tracks? I mean, they were OK but not great and they didn't utilise most of the tape also? F1 stuff was cool but that was digital. Now that sounded great! Terrible signal loss over time though. What I find funny about the cassette revival is the indie designers have started adding dbx or Dolby logos on J cards for nostalgia's sake but for no technical reason. I've bought a few new cassettes in the last couple of years and they don't sound great in general but they are nice to own and it supports independent artists so I'm all for that. I cannot see that helps the supposed problem much? Cassette tape can "pack" against one side of the case and cause wow and probably weaving over the heads and poor sound. Just flipping the cassette round won't fix that AFAICS. But again, it is not a problem I ever had. My first machine was a mid priced Yamaha which was not a full, i.e. vertical front loader, never a bother. Later came the Denon* full frontal but servo loading and twin capstans and a precision transport takes the cassette housing largely out of the performance equation. Again, no flipping problem! I now have a rather nice Sony Dolby S machine and am setting up to digitize a big stack of son's cassettes. *The Denon was an uncollected repair. It had been dropped and the capstan servo board cracked plus other damage. Since it was impossible to give even a guess at cost I quoted a high minimum but with the caution that labour costs could double that. I also had no idea how much a new servo board would cost, in the event, very reasonable! I spent quite some time tracing and fixing other breaks though. No, I am talking of a VIDEO system that used 1/2 the tape width and could be flipped as per a Music cassette. I don't know but I would guess the audio was a version of hi fi video sound. Before that I had a Ferguson (aka JVC) VHS machine and the HF sound on that was a revelation! Cassette really took off back in the day because of the features it offered teenagers that we couldn't get in any other domestic format, not because of the sound quality. 1) you could record stuff you didn't own from records/radio. The cassette grew from a dictating machine concept AFAIK and was never originally intended as a very high quality music medium, but, as you say it was SUCH a handy device that people used it as such. Many here will remember the portable mono recorders with piano key transport controls! Eventually machines were developed that had at least as good a spec as vinyl but with none of its vulnerabilities. I will agree that commercial high speed copied tapes were never quite to LP standards? The record industry of course HATED it! Blamed it for robbing the musicians of income (more the junketing fat cats of course!) We had the "Tape Levy" lobby and millions were spent on "inaudible" copy spoiler development. All seems very silly now. However, even today there is still no other convenient way to record an audio source such as a radio programme or TV sound. Oh! I 've got two of those and one is a Grundig FCS! One of those is being integrated into the digitizing "suite" I am building with the cassette machine and a DVD player. I also have a VHS machine but have not fired it up in yonks so have to see if it still works. Wait, people still have radios and TVs? I thought teh kids just used their phones for everything now! I prefer cassettes to CDs (and I dislike streaming as well). Well it may have been a bit of a gimmick (I never noticed a problem with the auto reverse in the car) but I've just got hold of one of those decks and it works very well as a player - it just seems to sound more stable than the other decks I have here. I do have a Hitachi 3 head dual capstan machine that needs new belts but I think the Nakamichi, despite being only a single capastan machine, sounds better. Hugh Robjohns wrote: Moreover, the self-erasure issue with cassettes tends to appear worse than it really is because of the almost ubiquitous use of Dolby B, such that a slight loss of HF from the tape is further reduced by the mistracking action of the Dolby B decoder. There is a plus side here, in that cassettes I recorded in the late 70s and 80s with Dolby encoding sound quite reasonable now with the Dolby switched off. In other words the Dolby encoding is compensating for the HF loss. It's all very rough and ready and of course you lose your hiss reduction but what the heck. If it sounds OK after all this time you're not doing too badly. Aha! They HAD to flip the cassette because you need two capstans for auto-reverse! But I doubt there would ever be a tape handling problem with a Nakamichi? REALLY well engineered. I'm not sure either way on tape self erasure. I understood that higher energy tapes were harder to erase just as they're harder to magnetise. So a Type II or Type IV tape would be less subject to accidental erasure than a Type I.
I also thought that multiple plays in a machine tended to gradually erase tapes hence the qualifier with calibration tapes to check them after a certain number of plays, not necessarily after a certain time. Also the need to properly demagnetise a tape machine to minimise the tendency to gradually erase tapes after multiple plays. It's wavelength related too, only indirectly to frequency. So a loss of 3 db at 10kHz on a cassette would be equivalent on a pro reel to reel tape to a loss of 3 db at 80kHz which of course no one would notice. I agree any serious test needs to be done with careful measurements. The thing with tape is that there are multiple causes for loss of the highs, not just self erasure. So , a tiny speck of dirt on a repro head, a worn or misaligned head, in various planes, can be enough to compromise the highs. It's often not appreciated that just playing a tape back at its optimum is not always easy. Here's an example of a cassette recording (Maxell UDR Type I) I made off the TV in 1976. It's been played many times over the years but it seems to have survived reasonably well. Of course this cassette recording off TV cant hope to compete with the original BBC videotape's audio quality. The vision isn't my recording, only the audio. With respect to auto-reverse sound quality, I found it depended on the system (albeit only two data points from me) - the system I had where there was a stereo head that was rotated when the tape was reversed was very much prone to mis-tracking. The other system was a four track head which was electronically switched when reversing direction. The latter was much more reliable.